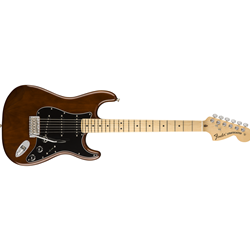 The Fender American Special Series Stratocaster. Everything you want in an affordable U.S. made guitar is within your reach. Features include an alder body with gloss urethane finish, 9.5” radius maple neck, jumbo frets, Texas Special pickups and vintage style synchronized tremolo. The American Special Series guitars for the times.